Mauro Stasi started iRov Underwater Services in 2006, and became VideoRay's Italian dealer in 2007. Based in Conegliano, Italy, iRov provides underwater technology and ROV assistance to the salvage, oil & gas, military, civil engineering, and port security industries. In 2011, iRov became an ROV Contractor Member of IMCA (International Marine Contractor Association), and was accepted as an ISU (International Salvage Union) Associated Member in 2013. 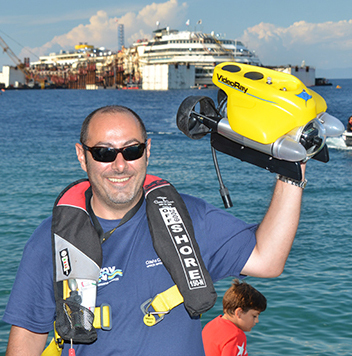 Mauro's most notable accomplishment with VideoRay ROVs to date is his work with Titan Salvage on the Costa Concordia. Mauro coordinated and implemented all ROV operations and staff on the salvage project. Over the course of the entire project, Mauro and his crew recorded 55,000 hours of ROV footage, which was used by Titan to survey, assess, monitor, and report the project's progress.